Our team(Blue/white/gray) has a prayer at mid court after every game. Well last night the opponents asked to join and they all recited the Lord's prayer. Does the heart good to see that. Every once in a while a youngster surprises me with something like this. then I realize I may be a part of the problem with my expectations. Till they start ta get a paycheck ta play the game. 100% of that group won't. 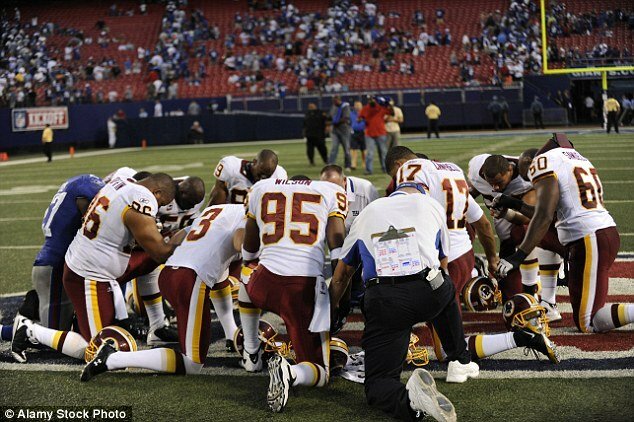 This group ain't protesting, they are praying and there are many more photos like this. Don't let the very few distort the image of the good. Didn't mean anything by your team, just in general some of the behavior ya see in the pro rank's. I have a daughter that play's high school sport's and it makes me feel good when i see thing's like this.